Radio Rosario is a new one-man show by Galway-based writer, performer, story-teller and musician Little John Nee which will premiere in the Mick Lally Theatre, Galway 4th-9th September. Little John Nee is widely regarded as one of Ireland’s leading solo theatre performers, a writer and performer, whose style of storytelling theatre with music and song has won him international recognition. This exciting new production has been developed through FUEL – Druid’s Artist Residency Programme. 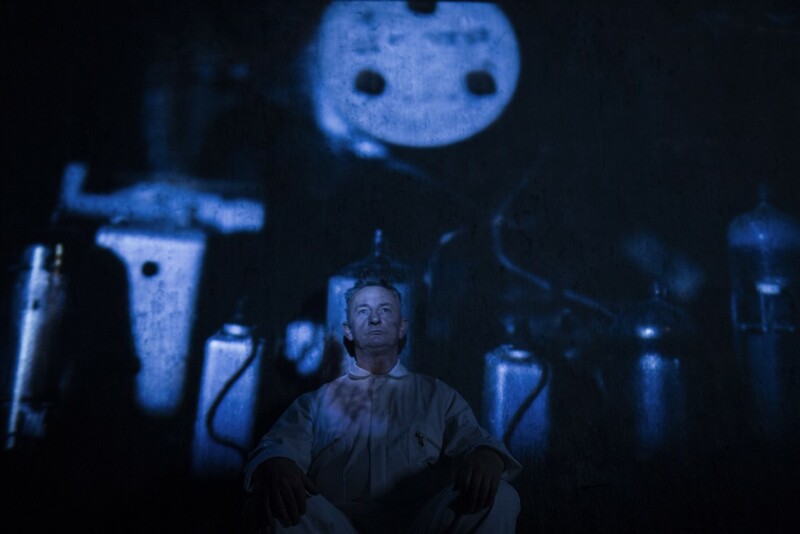 In Radio Rosario, Little John Nee brings his mesmeric musical storytelling to another dimension through his collaboration with long time associate, musician, visual artist and director Laura Sheeran. They are joined by a multi-award winning team, including recording engineer and producer Tommy McLaughlin (Villagers, SOAK), designer Triona Lillis (An Klondike), and lighting designer Sarah Jane Shiels (WillFredd Theatre). Radio Rosario is about the hijacking of imagination for nefarious purpose, and the subsequent deficit in imagination to create a better world – a serious comedy about frustration and foreboding and the search for fulfillment, and an ode to “the magical wireless” / “that radio yoke”. “i record audio for advertisements. Developed through FUEL – Druid’s Artist Residency Programme. Supported by The Mick Lally Theatre and An Grianán Theatre. Funded through an Arts Council Theatre Project Award. Little John Nee is widely regarded as one of Ireland’s leading solo theatre performers, a writer and performer based in Co. Galway, whose style of storytelling theatre with music and song has won him international recognition. In the early 1980s his performances as Charlie Chaplin saw him established as one of Grafton Street’s iconic street characters, before a move to Galway in 1986, when he joined the fledgling Macnas whom he performed with for many years. In the 90s Little John became convinced of the simple power of human communication. Since then he has developed and refined his unique style of musical storytelling with physical theatre, with works including The Derry Boat, The Mental and Rural Electric gaining rave reviews in Ireland, the UK and the US. He has also recently published a book of haiku, The Apocalypse came on a Friday. Little John Nee was the recipient of a Galway City and County Theatre Residency (2007-2008) and an Arts Council Theatre Artist Residency Award at the Town Hall Theatre (2013-2014). I just want to mention I’m beginner to blogging and certainly savored your blog site. More than likely I’m likely to bookmark your site . You absolutely have incredible stories. Thanks a lot for sharing your website page. What i do not realize is in truth how you are now not really much more neatly-appreciated than you might be now. You are so intelligent. You understand therefore considerably in relation to this matter, produced me individually imagine it from a lot of varied angles. Its like men and women don’t seem to be fascinated except it¡¦s something to do with Woman gaga! Your own stuffs outstanding. All the time handle it up! I want to express my admiration for your kind-heartedness in support of those people that must have guidance on your area of interest. Your real commitment to passing the solution all through came to be exceedingly valuable and has regularly allowed regular people just like me to realize their goals. Your new warm and helpful information entails much a person like me and a whole lot more to my office colleagues. Warm regards; from all of us.